My brain constantly generates ideas for games. Campaign concepts, plots, characters, equipment, locales, and more are forever trickling from the recesses of my mind like light but unending rain. Every so often that persistent drizzle turns into a deluge. When this happens, the rivers that carry my creations from my head out to my hands (so that I may write, type, or illustrate the things I'm imagining) overflow. The thoughts flood through me and I become very frustrated, anxious, and even depressed knowing that little of this monsoon of gaming goodness is ever going to see the light of day. It's too much, coming too fast, and usually the ideas flowing in these instances are too high concept, too odd to find an audience. The flooding rivers do not aid the drought plagued villages. They drown them. I've been experiencing this phenomena for the past few weeks and it's getting to me. Even more so with recent gaming frustrations and opportunities that simply aren't helping. This time is different from such phases in the past as I have an awesome girlfriend who gave me a bang-on suggestion. She said that when similar thoughts and feelings come to her she writes them down. All of them. Stream of consciousness style. She gets them out of her head and on to paper or screen where she can actually analyze their worth and they aren't taking up valuable mental real estate. So here are the [primary] campaign concepts that have come to me and won't leave me alone. I keep coming up with material for these while other thoughts for other games and other game ideas themselves (literally dozens upon dozens) come and go at break neck speed. As I've mentioned before I'm not a big fan of traditional Dungeons and Dragons style RPGs or settings but I do like them a bit more when they contain a twist. My own D&D-But-Not setting seems like a Fantasy game but really it's not, being structured and styled more like a Superhero campaign. 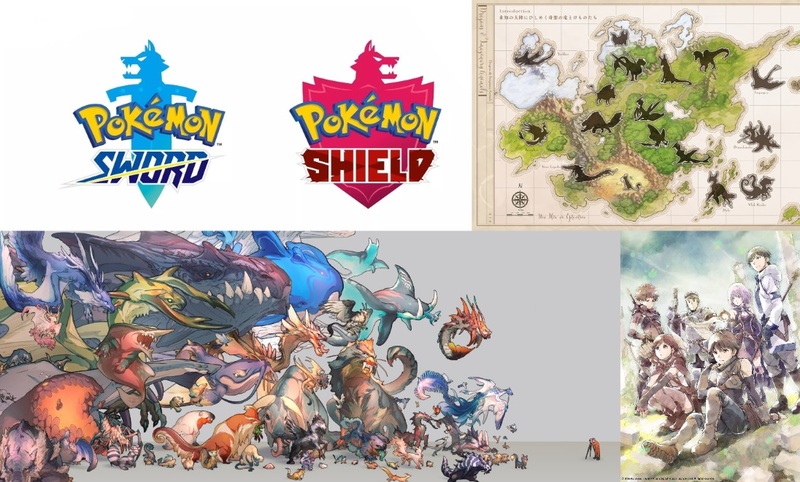 The recent announcements of a new Pokemon game for the Nintendo Switch, Pokemon Sword and Pokemon Shield, a plethora of Western-Style Fantasy Anime and Manga, and the release of Creatures, an artbook of incredible imaginary beasts by Rei Yamamura has me imagining a setting in which Monsters are more than threats in a dungeon. Imagine a Medieval Fantasy society were Monsters are EVERYTHING! They are sources of food, clothing, and magical ingredients, hazards in the wilderness and the dark places of the world, but also part of the family. They work on the farm, herd and protect livestock (which may or may not also be Monsters), and sleep at the foot of our beds at night. It would be mixture of Dungeons & Dragons, Monster Hunter, and Pokemon. I am really loving this idea but I am pretty sure practically no one I currently game with would be into it. I've been wanting to run a new Wares Blade campaign ever since I first learned about the Reboot Project. Check out the webpage! Now, with the introduction of the awesome miniatures depicted above - incidentally called, 'WARES LEGION' - the desire has only doubled. The thing is, I can't get those minis at this time and I have no interest in a tactical war game even if it's Wares Blade based. A tabletop (or 'tabletalk' in Japan) Role Playing Game though, yes, that is something I am definitely interested in and these minis just massively inspire me and give me added enthusiasm for a game concept I've liked for many years now. Again, as I pointed out in Idea #1, I am intrigued by Wizard and Warrior Fantasy if you can put a good enough spin on it. Being the major Mecha fan that I am, adding them to Fantasy absolutely has me on board. Here is an idea I've had for ages that has recently returned with the tumble of other campaign possibilities tormenting...I mean...occurring to me of late. 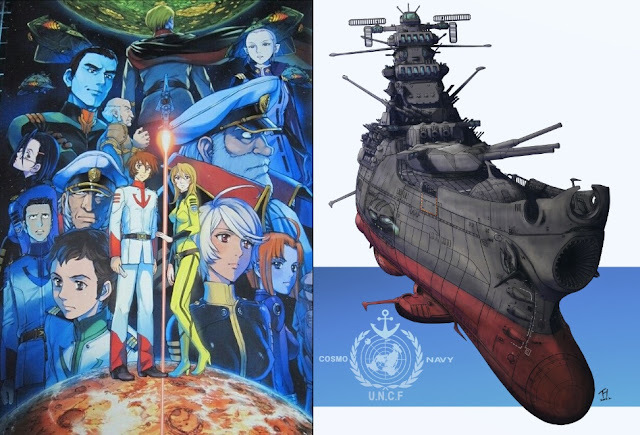 Based on the Manga and Anime classic by Reji Mastumoto and Yoshinobu Nishizaki, Space Battleship Yamato, better known in the US as 'Star Blazers', is the story of a war in the future between the United Nations of Earth and the Great Gamilas Empire. Gamilas initiated the conflict by launching radioactive meteor bombs at the Earth, the impact of which will result in the extinction of the Human race in one year's time unless the crew of the UNCF Yamato can find the radiation neutralizing Cosmo DNA on the distant planet of Iscandar. My love of Space Battleship Yamato could easily be the subject of a future Thorough Thursdays entry (and probably will be). I loved coming home from school each day in time to catch the American translation (Star Blazers). At the end of every episode, the number of days the Earth had left before everyone was dead would appear on the bottom of the screen. Intense! A campaign of this may at first seem like a more military focused Star Trek, but with it's World War II allegories, Metaphysical 70s Sci-Fi, and distinct visual design, it reminds me more of Space:1999 meets the original version of Battlestar Galactica. I think this could be very cool. Cyberpunk is a genre I haven't visited in a long time. At least, not directly. With my formative teen years of pop culture consumption and gaming having taken place in the 1980s, Cyberpunk is like salt and pepper, it gets added to everything out of habit. While my Traveller games see a lot of Cyberpunk influence, they are not Cyberpunk; Traveller remains very much the Hard Science/Space Opera game of Traveller no matter how many megacorporations and cybernetic mercenaries I throw in. 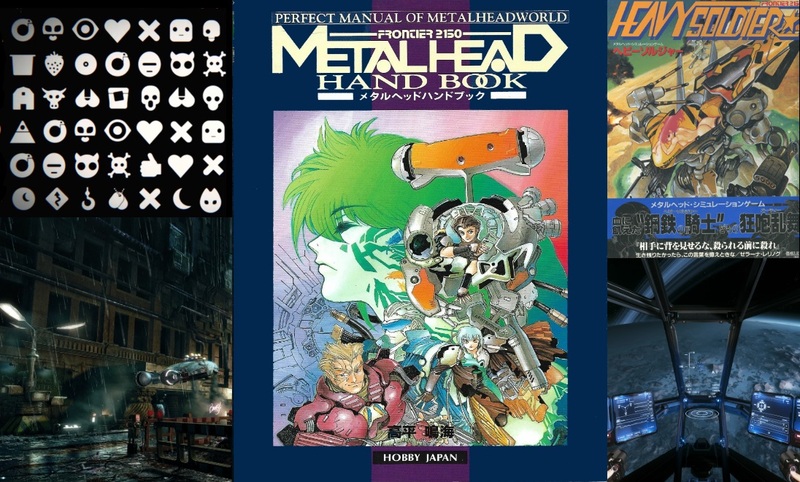 What I am talking about here is closer to the Japanese TRPG Metal Head. Instead of a Space Adventure game with cyber-technology added in as a bit of spice, this is a Cyberpunk game that answers the question, "What the heck is up with Blade Runner's 'Off-World Colonies'. Where are Humanity's space programs at in the worlds of Ghost in the Shell or Cyberpunk 2077? 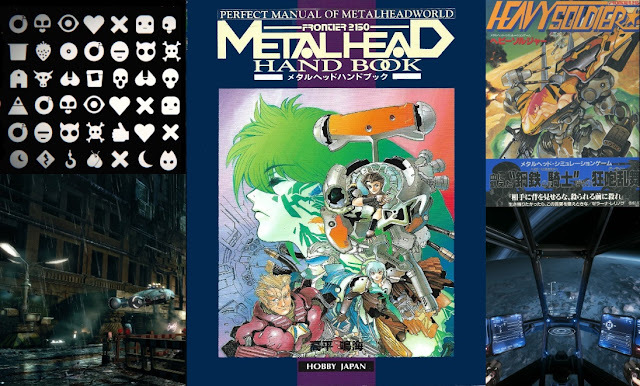 Set in 2150 (and later in future editions), Metal Head is a game where you can explore the classic themes of Cyberpunk - the effect of rampant technological advancement on Human society, the nature of what it means to be Human in the face of uploading your persona to an Artificial Intelligence, and so on - while also investigating how our curiosity and drive will forever push us to expand our understanding of the universe. This is one case where the inspirational images I've chosen don't really do it justice. I have so many visions of what this would be that I had trouble distilling them into a single frame. It's Love, Death, and Robots, Blade Runner, Altered Carbon, Ghost in the Shell, Bubblegum Crisis, and so many other high tech dystopian genre greats crossbred with the limitless hope of space travel. 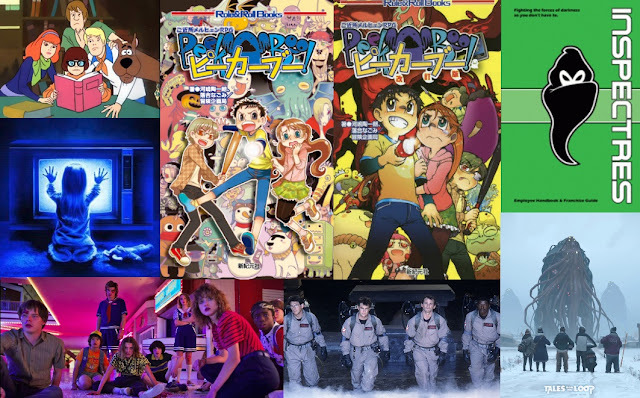 One idea I have that comes and goes from time to time is a Comedic Horror game primarily based around the Japanese Tabletalk RPG (are you seeing a theme here? Me too) Peekaboo Horror. The basic premise is that you play pre-teen/elementary school kids fighting ghosts and supernaturals monsters in your neighborhood. The twist on this that makes the game unique is that each player plays two characters, an Innocent (the kid) and a Boo, or Spooky (a spirit or other paranormal entity). In my few previous times running this game I had the players play each others Boos. In other words: John plays his Kid and Cindy's Boo. Ryan plays his Kid and John's Boo. Cindy plays her Kid and Ryan's Boo. That kind of thing. The idea has come back to me again and that is largely due to the announcement of Stranger Things Series 3, a new Ghostbusters film in 2020, and some recent discussions with friends of mine from high school about our old Ghostbusters RPG campaign. Like Fantasy, Horror is not a genre I enjoy generally speaking but if mixed with Comedy and leaned more toward Quirk/Creepy and less toward Gore/Shock, I find it can be a really fun and rewarding gaming experience. There are other ideas but these are the ones I keep coming back to. Truth be told, I started this post days ago and my mind has calmed down quite a bit. As a result, I am able to think a bit more clearly and there may be one additional game concept that has occurred to me and may just be the one I will use for a new Gamemastering opportunity. You now I'm not big in japanese-influenced gaming (though I have been lately considering the Infinity RPG), but your "Monster Trainers in a Medieval Fantasy World" idea sounds very interesting, both from a world building perspective and as a twist to D&D. It will familiar enough to explain the world in one or two sentences and makes a lot of sense as a "D&D world", yet the dynamics would be quite different and the setting's aesthetics will make it instantly recognizable. I really think you are onto something. I may explore this idea further in a future post. I know what you mean, I have the same problem and writing down my ideas really helps. Now my problem is where to keep my "idea paperwork". And I have these ideas that just keep coming back, and won't go away. I have a feeling that those ideas will be useful in the future, something worth sharing with others. My name is Adam Dickstein and I am a Writer, Artist, General Creative Person, Gamer, Dog Lover, Food Lover, Science Fiction Fan, Trekkie, Comic Book Fan, Muppets Fan and all around nice guy. I began playing role playing games with D&D in 1977. I have been gaming for over 40 years! I've worked in the comic book and gaming industry in one capacity or another for over 20 years.